Heat oven to 375°F. Grease a 12-cup muffin tin. Combine brown sugar and Guinness in a medium saucepan over low heat. Cook, stirring occasionally, for 1 hour or until liquid is reduced by half and mixture has thickened slightly. Remove from heat and cool slightly. Meanwhile, make the wontons: Place one wonton wrapper in the bottom of each muffin tin. Top each with a tablespoon of chopped corned beef and a tablespoon of shredded Swiss cheese. Top each with another wonton wrapper, then top with another tablespoon of corned beef, a tablespoon of sauerkraut and a tablespoon of shredded cheese. Bake 15 to 18 minutes until edges are golden brown and cheese is melted. 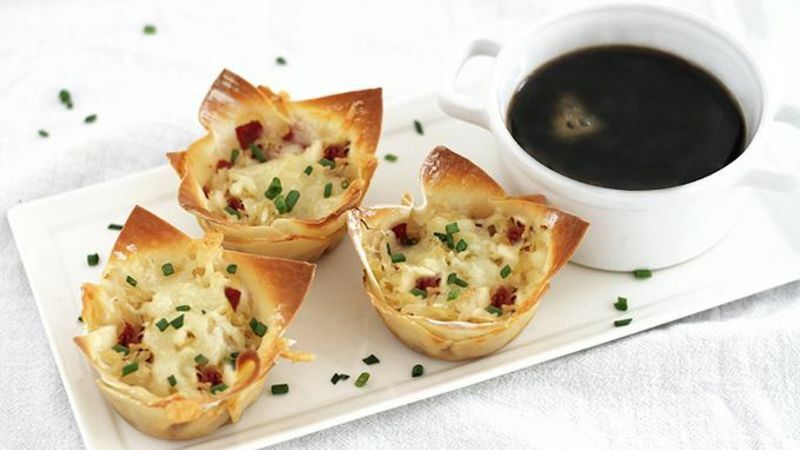 Remove wontons from muffin tin; sprinkle tops with chopped chives. Serve immediately with cooled dipping sauce on the side. These savory cupcakes are perfect St. Patrick's Day nom, wrapped up in a crunchy wonton shell. Savory cupcakes and sweet, boozy dipping sauce for the win! These Irish-inspired wonton cupcakes with a sweet Guinness dipping sauce on the side are a great idea for St. Paddy’s Day – whether for a big party or a party of one on the couch/House of Cards marathon. They’re a variation of Christy’s oh-so-famous (and oh-so-tasty) lasagna cupcakes and all I have to say is: Ladies and gents, prepare ye-selves for a lot of deliciousness. First, make the dipping sauce. It’s basically a reduction of Guinness and brown sugar, and it turns into tasty magic. While the sauce is a-simmerin’ on the stove, make the wonton cupcakes. Grease a 12-cup muffin tin, chop up some corned beef, shred some Swiss cheese and get ready to roll. Place a wonton wrapper in the bottom of each greased muffin cup, then top with a tablespoon of corned beef and shredded cheese. Top that with another wonton wrapper, more corned beef, a tablespoon of sauerkraut and more shredded cheese. Bake it all up until the cheese is melted and the wontons are crisp and deep golden brown. Sprinkle the cupcakes with chopped chives and serve immediately with the boozy-sweet reduction on the side. Blimey, these are good! Stephanie (aka Girl Versus Dough joined Tablespoon to share her adventures in the kitchen. Check out Stephanie’s Tablespoon member profile and keep checking back for her own personal recipes on Tablespoon!